CouRaGeouS Cuentos Launch Party Tuesday! 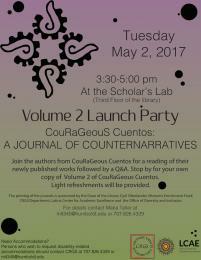 Humboldt State University Press invites you to join us for the launch of CouRaGeouS Cuentos: A Journal of Counternarratives, Volume 2 on Tuesday, May 2 from 3:30-5pm in the Scholars Lab, 3rd floor of the Library. This journal is full of creative writing from students in classes offered by the Department of Critical Race, Gender & Sexuality Studies. Hear powerful readings and enjoy light refreshments as we celebrate the students' hard work.